First and foremost, for the first time in nine years, May came and went without a visit to Yale for a MRI. However, I couldn’t stay too far away and these visits were happy ones. Along with my colleagues from the CT Brain Tumor Alliance, we presented the Yale Brain Tumor Center with a check for $20,000 for patient assistance funds at the Smilow Cancer Center and to support their ongoing brain tumor research. My surgeon and I exchanged a hug and a few words and I joked with him that I missed him and wondered if he had erred in not scheduling my MRI. After years of battling, it felt good to finally share a laugh. The CTBTA also presented funding to Hartford Hospital, St. Francis and St. Vincent’s and we will be visiting Connecticut Children’s Medical Center and the UCONN Health Center in the near future. 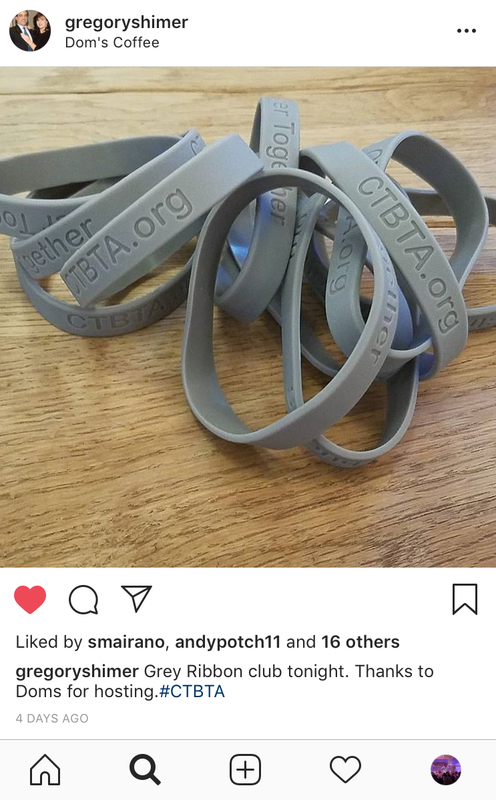 Aside from our check presentations, the CTBTA has been very active of late, and I am delighted to share that we recently added five new members to our Board. Please join me in congratulating Cheryl Italia, Dan Tapper, Dr. Alexandra Flowers, Aisha Khan and Stephanie Simmons! We are so lucky to have these five individuals join our mission and work to forge an even stronger alliance! The CTBTA also supported “A Thoughtful Approach in the Fight Against Brain Tumors: Personalizing Care for the Best Outcomes”, a seminar hosted by the Smilow Brain Tumor Program for patients and caregivers. Dr. Jennifer Moliterno presented on state-of-the-art neurosurgical approaches to optimize removal of brain tumors, even making inoperable tumors operable and neuro-oncologist, Dr. Zac Corbin provided an overview of clinical trials and treatments post-surgery. Aside from my work with CTBTA, my family and I are hard at work, planning for another successful Playing for the Cure: Brainstormin’. The fundraiser is being held on Friday, September 14th at Stony Creek Brewery and we cannot wait for the day to arrive! A huge THANK YOU to the companies who have already committed as a sponsor and to our many friends and family who are supporting this event again. We are excited to announce that Heat, Connecticut’s favorite cover band, will be performing this year and Stephen and Parkville Sounds, LLC will be mixing and producing the band! But the real excitement, at least for me, will be on the night of the event, sharing with you the impact of your dollars on the brain tumor community. Ten years ago, I was diagnosed with a very rare tumor and I am excited to share that on September 14th, attendees will hear from Dr. Murat Günel, the chair of the Department of Neurosurgery whose team conducted the research on central neurocytoma. We will be joining Dr. Günel and his team for a presentation of their findings and to tour their lab. I am excited to hear the findings and to see how this study will help the next patient and family that is diagnosed. With your support over the past four years, we are making a profound impact on lives and a brain tumor diagnosis. Stay tuned for an update! Ten years ago, I was afraid – not knowing what to expect after brain surgery, let alone the subsequent surgeries. I went from a hopeful lawyer to gaining employment in the non-profit world and do not intend to look back. When we started this fundraiser five years ago, it was our way of showing gratitude for Yale, brain surgeons, clinicians and nurses all over the world. Thanks to the unbelievable sponsors and supporters, you gave it new meaning and together, we are closer to making our goal of finding the cure a reality. This past Thursday, we made a visit to the Yale Brain Tumor Center to present the net proceeds of our fundraiser. The majority of hospital visits are not fun, but this day is always filled with smiles because of the hope that it inspires. The collaboration between Yale and my family is truly special and something that I know each of us takes to heart. I cannot thank my family and friends who helped to make this year such a huge success and cannot wait to top it in 2018 as we celebrate my 10th anniversary! Thank you, Wise Old Moon, for headlining this event and for your enthusiasm to be a part of this event the past two years. I wish to again thank our corporate sponsors – ShelfSpace Marketing, LLC; Carla’s Pasta; Specialty Packaging; Al Mac Motors; Beirne Wealth Consulting; Sullivan & LeShane, Public Relations; iHeart Radio; WTNH; Stop & Shop; Bank of Montreal; People’s Bank; Connecticut Public Broadcasting Network/CPTV; Edge Technology; Unitas Club; Updike, Kelly & Spellacy, P.C. ; Henry, Raymond & Thompson; Guida’s Dairy; Blum Shapiro; Sardilli Produce; Webster Bank; and Russo, Russo & Slania, P.C. Thank you Shoreline Cafe & Catering and Beach Donuts for donating the sandwiches, donuts and coffee! To every individual and company that donated items to our raffle and silent auction, your support is appreciated. And last but not least, thank you Stony Creek Brewery for being an awesome partner in this venture. The support and awareness that you are bringing to brain tumors is amazing and appreciated by everyone affected by this diagnosis. Through everyone’s efforts, a grand total of $42,800 was donated to the Yale Brain Tumor Center this year! As a survivor of this diagnosis, with my family and friends who wanted to help my doctor and his team in some way, I am in awe that between our four concerts and the donation from the Denver Foundation, we have donated $156,650.00 in four years! The money we have donated thus far has been used as seed funding to help doctors and residents take their research efforts from concepts into reality. To date, there has been a dedicated undertaking to understand more about the triggers of particular brain tumors and their drivers. Research is also ongoing to develop nanotechnology to safely administer viruses to particular tumors to destroy the cancer cells, but without harming the brain. Additionally, within the next six months, Yale will be publishing a study of great interest to my family and I. A couple of years ago, I was contacted by a resident at Yale who was studying the genetic drivers of central neurocytoma. I donated a blood sample and a piece of my tumor was obtained by the lab to understand the cause of this mutation. The Chair of Neurosurgery at Yale is overseeing this study and shared this status update with me. I plan to meet with him and the resident working on this study to learn more about their findings before the paper is published and I will share these updates at a later date, as well as the resident’s thesis. What was told to us, and which comes as no surprise to any of us, is that this tumor type is vastly different from any other tumor and does not share many commonalities. Life is unpredictable. This is not even something you can conjure up in a dream, but if you had, and told me it would happen to me, I would have said “no way”. Yet, it did happen and I survived and because of it, I am a better person. I have a new outlook on life and a new normal. That double vision nine years ago – it all makes perfect sense now. What can I say! I am humbled and blown away by the outpouring of love and support from so many. To our Annual and Presenting Sponsors ShelfSpace Marketing, Carla’s Pasta and Specialty Packaging LLC. for making this night the best yet! A HUGE thanks to Renee DiNino and iHeartRadio for being our emcee and giving us amazing coverage! A very special thank you to Sullivan & LeShane Public Relations, Inc. and WTNH News 8 for sponsoring and bringing great awareness to this cause. And while the list is too long, a big thank you to all of our sponsors who made the night possible and enabled us to pull this off. Thank you Stony Creek Beer for hosting us again and your support during the month of September – you guys are great! Nine years ago, I never would have thought I would want to talk about brain tumors, let alone that I would find it my passion. As my doctor told you last night, I am cured of this and now it is my opportunity to give back and aid doctors and researchers find the cure, but to also be a ray of hope for those fighting this battle. Fortunately, we are on our way. While we are not ready to share an exact dollar amount, I am pleased to share that we shattered last year’s efforts!! Together, we took another step forward in helping doctors at Yale find the cure and I believe we will see the day. And if you thought last night was a great time, get ready to celebrate my 10 years of survivorship in 2018!! Get ready Cusano clan! Thank you everyone! Check back soon or visit cusanosagainstbraintumors.com.